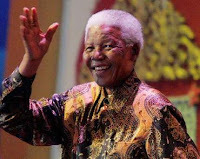 It's Nelson Mandela's birthday again, and as you might expect, we're celebrating with music here at SoundRoots. This track comes from the 2008 compilation South African Women With a Voice, Chapter 2. I know little about the singer, Linda Kekana, though I did just pick up her 2002 album I Am an African, and I'm eager to dig into it. Some put her in the company of African jazz greats. 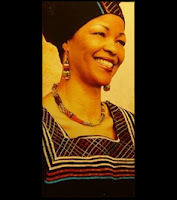 Linda Kekana hails from Johannesburg South Africa. Every once in a while a Jazz diva is born and Linda Kekana is someone whose music is unique in style, profound in content and ahead of its time. Linda Kekana is surely one such person. Linda Kekana carries influences of some of the richest music in South Africa. It is such influences that shaped Linda Kekana's present, and that will definitely have a bearing on the future that is about to take off with her debut solo album Rebirth. Linda Kekana is a product of the angelic voices of Letta Mbulu ad Shirley Bassey as much as she has drawn courage from the lyrical prowess of Miriam Makeba, Nina and Caiphus Semenya equally contributed to Linda Kekana's musical upbringing. In any case, here she is singing a song recorded in 2000 for Mandela. A quieter outing than Brenda Fassie's "Black President" to be sure, but no less moving. Sorry, by the way, for the unannounced absence. Summer -- or what's passing for summer in the Pacific Northwest this year -- has edged out some of my blogging time, but I still have lots to share, including an upcoming guest post on a delicious style of Afro-Brazilian music. Thanks for understanding.